In a recent appearance on the Jan. 3rd ComputerAmerica show I stated that you "needed" both a router and a cable modem with gigabit WAN ports (meaning the connection between the cable modem and router) in order to achieve the higher speeds that some ISPs are now offering. This caught the attention of Michael Horowitz and his Defensive Computing blog. He also had some kind words for my book. (thanks!) However because my recommendation appeared to be too simplistic, it was taken to task on The Long View blog by Richi Jennings. Because my admittedly simplistic statements could easily be misunderstood, I wanted to add some clarification and comments here. I dug up my original speedtest results and upgrade timeline so I could tell the original story as it unfolded and then respond to some of the comments and questions raised in those blogs. When requesting the Ultra upgrade Comcast informed me that I would need a DOCSIS 3.0 modem. Since my existing modem included an EMTA (Embedded Multimedia Terminal Adapter) for my VOIP telephone service, they could either send out a technician with a new modem (at my expense), or I could exchange the modem myself at the local Comcast office. 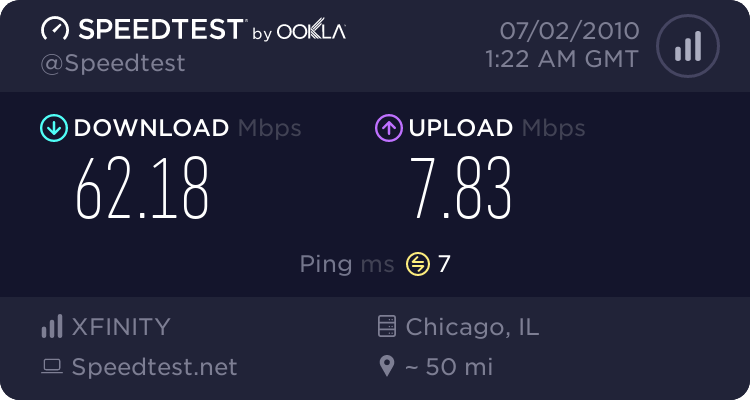 At this point I consulted with an associate who had also done an upgrade first to the Comcast Ultra and then to the Extreme 50 services, and he had been seeing the full 50/10 speeds and beyond. He had the same network hardware (including a D-Link DIR-655 router and gigabit switches) as I did *except* for the cable modem. His modem was a Comcast supplied Arris TM702G, while I had the Cisco DPC3000. We compared modem specs, and both the TM702G and DPC3000 were DOCSIS 3.0 modems and both claimed to have gigabit WAN ports. Both of us also had the WAN ports on the DIR-655 routers configured to force gigabit as well. To eliminate everything except the modems from the equation, we connected gigabit LAN equipped PCs directly to the modems. In his case the PC established a gigabit connection to the TM702G modem WAN port and the performance remained as expected, meaning he was seeing the full 50/10 speedtest performance. In my case however, the PC could only establish a 100Mbit connection to the DPC3000 modem WAN port and the performance remained stuck at 35/10. Thinking that my modem could be defective I went back to the local Comcast office for another exchange. I asked for a TM702G, but again they had none available so I was given a 2nd DPC3000. 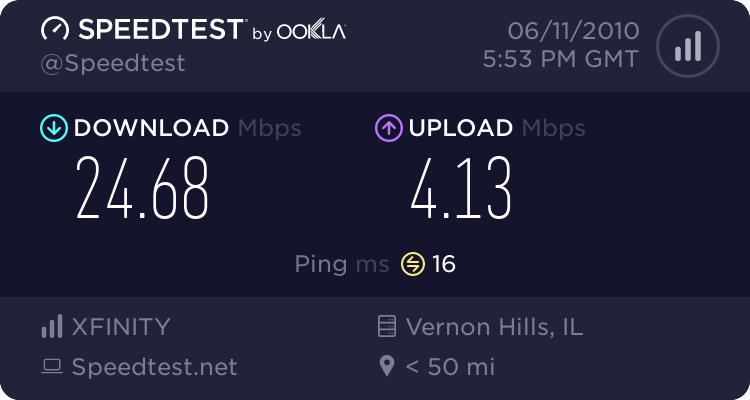 Upon installation the speedtest results remained the same (35/10 with a 100Mbit WAN connection). I even tried connecting the modem to the cable without the splitter but nothing changed. I now knew that the DPC3000 was the bottleneck. The DPC3000 specs. indicate it has a "Gigabit Ethernet and 10/100Base-T" WAN port, while in truth it is 10/100 only. The specs. also state that "...this DOCSIS 3.0 modem can deliver downstream data rates in excess of 160 Mbps and upstream data rates up to 120 Mbps. ", however the truth is that it cannot route traffic faster than about 35Mbps over the 10/100 WAN port. At this point I called Comcast and explained that the DPC3000 was simply inadequate to support the Extreme 50 service, and I asked that they replace it (and the TM502G) with a single TM702G unit instead. 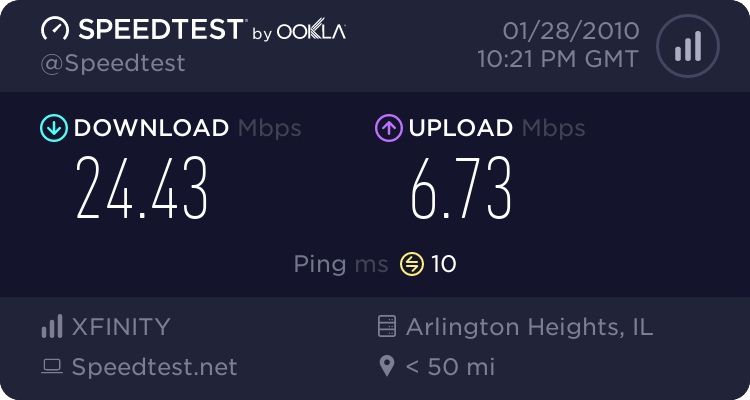 They balked at the request, saying that if I wanted they could send out a technician (at my expense) and that the standard DOCSIS 3.0 offering in my area was the DPC3000. That night, nature intervened. At around 3am a severe thunderstorm passed over and I experienced a *direct* lightning strike to the roof. The chaos that ensued is a whole other story, but what is relevant here is that included among the several thousands of dollars worth of devices and equipment instantly destroyed was the TM502G, while the DPC3000 survived. 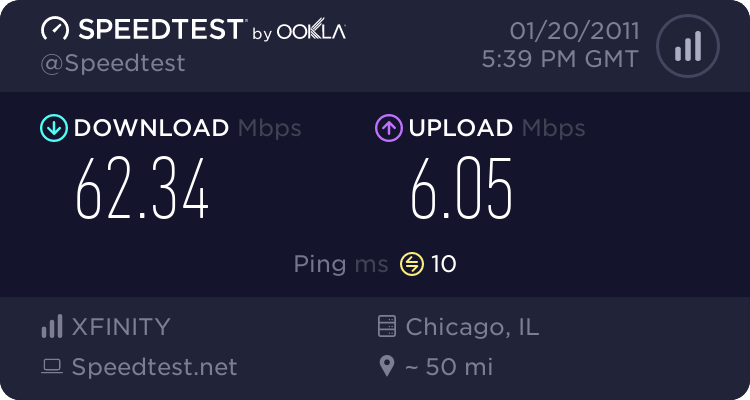 Since that meant I no longer had phone service, on the following Monday I called Comcast and explained the situation (no phone and 35Mbps internet) and after walking me through some tests to verify the TM502G phone ports were fried, they finally agreed to send a technician out at no charge. I practically *begged* them to send the tech with a TM702G, which they noted but would not guarantee. So what is the takeaway? 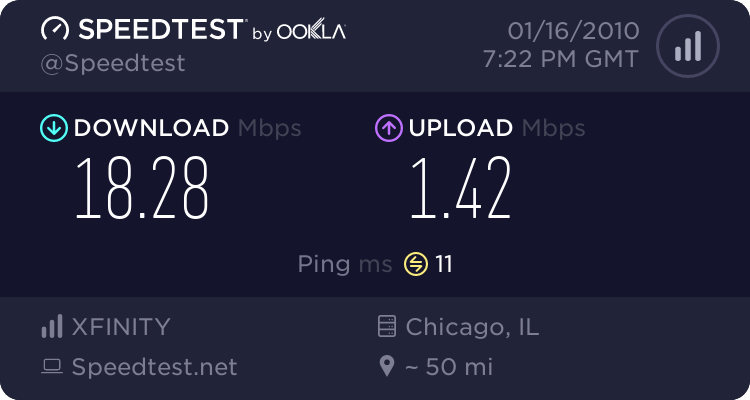 It seems clear that many commonly used modems (including those supporting DOCSIS 3.0) are simply inadequate for the higher internet connection speeds that are now being offered, and the problem will only get worse as even higher speeds are available. But what about the router? While my specific problem in getting the full Extreme 50 performance was caused by the modem, the router you use is also a potential WAN bottleneck. In fact it would have become a problem had I not upgraded to the D-Link DIR-655 beforehand. To see the effect of router performance on your internet connection speed, I found an excellent resource showing WAN to LAN throughput for various routers. If you look at the table you'll see many of the routers listed are inadequate for 50 to 100Mbps and higher connection speeds. What is an easy way to pick a modem and router combination with the "horsepower" that will support those higher speeds? Easy; choose those that include gigabit WAN ports. If you filter the WAN to LAN throughput table by checking the gigabit WAN box, you'll see that virtually every router that remains would be capable of hosting 50 to 100Mbps or faster connections. And that was really the crux of my original overly-simplistic statement. You don't actually need the raw bandwidth of a gigabit LAN connection to the PC to support faster broadband connection speeds (unless of course they are near 100Mbit or faster), but if you choose both a modem and a router with gigabit WAN ports you are virtually assured that the chipsets and firmware included will have the "horsepower" necessary to route 30+Mbps traffic through the gateway. Indeed there are! I probably should have said that gigabit WAN ports are *highly recommended* (instead of "needed" or "necessary"), as it virtually guarantees you have the WAN gateway traffic routing "horsepower" needed to support the 30+Mbps speeds offered today. Is it possible to find a DOCSIS 3.0 modem and router with non-gigabit WAN ports that can route gateway traffic at those higher speeds? Probably, but I don't know of any examples. On the other hand if they both do have gigabit WAN ports then you are virtually guaranteed to have the necessary gateway throughput capability to support the higher speeds. 1. The Linksys WRT54G is a positively ancient design, first launched in 2002. Many of the later hardware revisions likely can't cope with the required throughput of a 50/10 connection. As you can see the WRT54G v5.0 limits my download throughput while the older v4.0 version limits it more severely. Older versions would limit throughput even further. 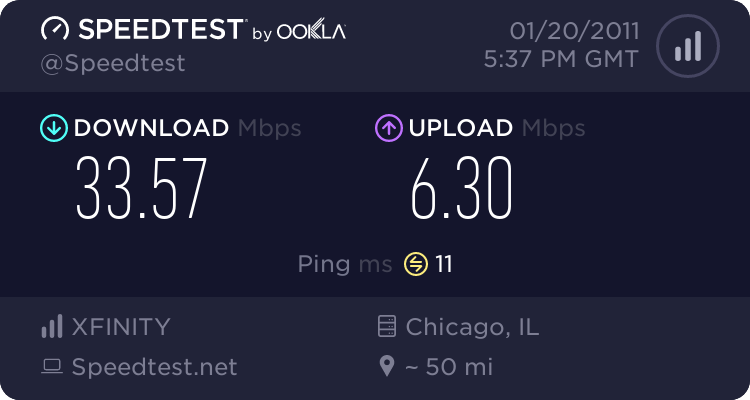 Had I not upgraded my router before signing up for Extreme 50, it would have been a bottleneck in addition to the modem. Note that PowerBoost is a temporary *increase* in speed over the provisioned rates. For example Blast! is 16/2 standard, 20/4 with PowerBoost. Ultra is 22/5 standard, 30/7 with PowerBoost. 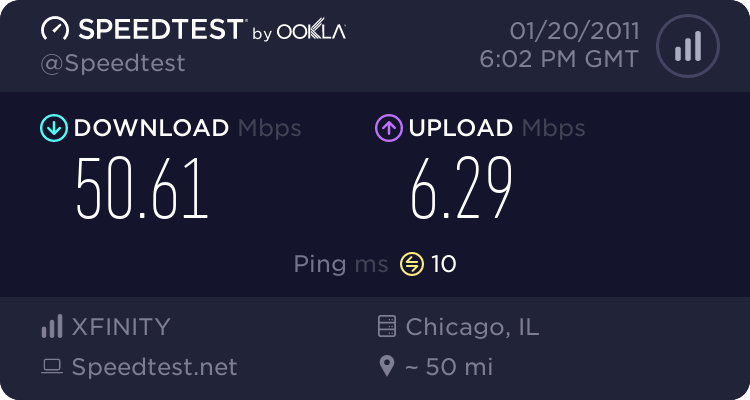 Comcast seems unclear about whether Extreme 50 includes PowerBoost but I've pretty consistently seen 62Mbps downloads in speedtest results, which seems to indicate PowerBoost may be involved. None of the other points in the blog post were relevant to my situation, and none of the comments would make me change my basic recommendation: If you are signed up for an ISP speed plan higher than about 30Mbps, make sure that both your modem and router have gigabit WAN ports as this will virtually guarantee that they have the necessary "horsepower" to route traffic through the gateway without creating a bottleneck. And of course it should go without saying that if you are planning to upgrade to 100Mbps or faster broadband speeds then gigabit ports will be *required* throughout the network. Scott.